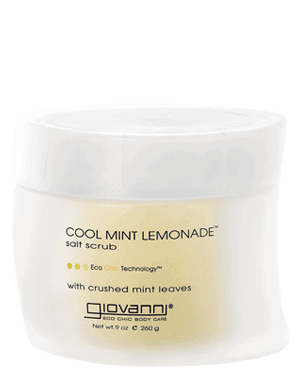 COOL MINT LEMONADE™ Salt Scrub with crushed Mint Leaves tingles with fragrance and is an invigorating body exfoliator that polishes skin’s surface, removing cellular debris. 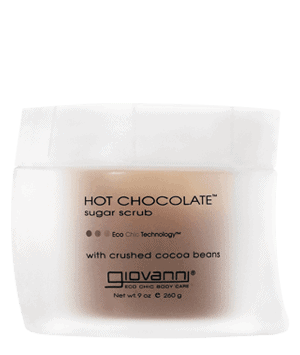 The richly scented formula contains the exclusive Giovanni Eco Chic Technology™ blend. What an intoxicating experience! Feel. Refreshed. Under a warm shower, dip into jar and then rub across body to exfoliate all over. Rinse. The second I rubbed this on my body, I was in heaven! I love this scrub. It had just the right amount of salt scrub to feel like it was exfoliating all parts of my body, gently. I loved the smell and how that added to the whole sensation. What I didn’t expect is how it made my skin feel after the process. My skin felt so moist with a hint of soft oil on it. My skin felt alive and new. Thank you Giovanni Cosmetics.